Stuttgart, Feb. 13, 2003 -- From the spring of 2003, the Mercedes-Benz E-Class will be available in a version with the worlds most powerful V8 passenger car diesel engine. The bi-turbo unit with common rail direct injection, together with other high-tech innovations, is capable of developing 191 kW/260 hp from a displacement of 3996 cubic centimetres. Through specific detailed improvements to the engine, the charge-air cooling and the exhaust system, the Mercedes engineers have managed to achieve an increase in power output of 7 kW/10 hp over the V8 diesel engines in the S, M and G-Class. The maximum torque of 560 Newtonmetres, available between 1700 and 2600 rpm, is also among the best for a diesel-powered passenger car. As a result, the car is capable of swift acceleration and powerful intermediate bursts of speed: the E 400 CDI reaches 100 km/h from a standing start in just 6.9 seconds, while the figure of 6.7 seconds for its acceleration from 60 to 120 km/h truly demonstrates its remarkable tractive power. These are new top figures for a diesel in this vehicle class. The bi-turbo engine has demonstrated its further qualities in the fuel consumption tests of the European test cycle. The EUDC combined consumption figure is only 9.4 litres per 100 kilometres, thus allowing the E 400 CDI to cover more than 850 kilometres on one 80-litre tank of fuel. The arrival of the new top-of-the-range CDI model means that there are now five state-of-the-art direct injection diesel engines in the Mercedes-Benz E-Class Saloon range. 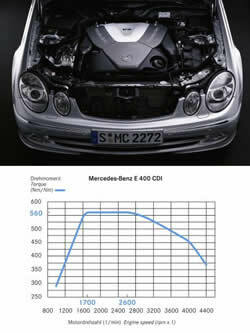 Their output ranges from 90 kW/122 hp in the E 200 CDI to 191 kW/260 hp in the E 400 CDI. As well as a five-speed automatic transmission, the standard equipment of this most powerful of diesel-powered passenger cars includes the electronically controlled air suspension system AIRMATIC DC (Dual Control), the four-zone luxury climate control system THERMOTRONIC, 17-inch light-alloy wheels and speed-sensitive power steering. Principally responsible for the impressive torque and performance development are the two exhaust gas turbochargers to the left and right of the cylinder banks. The bi-turbo systems electronic controls, with dual air mass sensor, enable it to work in a synchronised fashion and to adjust the supply of combustion air precisely to the required performance. This is made possible above all by the variable turbine geometry on the basis of VNT (Variable Nozzle Turbine) with electric and thus spontaneously adjustable guide vanes controlled by mapped performance data. The cooling of the intake air compressed by the turbochargers is undertaken by a water-cooled intercooler attached to a special low-temperature water cooler that is kept supplied with coolant by a separate electric circulation pump. This lowers the air temperature by up to 100 degrees Celsius, ensuring that the engine uses more air and can thus develop more power. Like all Mercedes-Benz CDI engines, the fuel injection system in the new E 400 CDI works on the principle of common rail. The injection pump has been specially developed for the eight-cylinder engine and can be controlled by means of an intake throttle according to need  depending on the injection pressure  ensuring that the fuel temperature is reduced by up to 20 degrees Celsius, so re-ducing exhaust emissions and lowering fuel consumption when compared to a conventional system. The intake throttle, however, acts merely as a pre-control for the high-pressure pump, with the actual injection pressure in the two rails still being provided by the electronic engine management and the regulating valve. A particular feature of the Mercedes-Benz CDI engines is what is known as pilot injection. Here, too, in the eight-cylinder units, this leads to an audible reduction in combustion noise. Just a few milliseconds before the actual fuel injection, a small quantity of diesel is allowed to flow into the cylinder, where it ignites, thus pre-warming the combustion chambers. This improves conditions for the main injection process that follows: the fuel ignites sooner, while combustion chamber pressure, temperature and thus also combustion noise are kept at a low level. The aluminium cylinder heads are designed to meet the particular demands of common rail technology. The injectors are centrally located between the four valves, thus ensuring optimum fuel distribution. The valves are controlled by two hollow-cast camshafts per cylinder bank, together with bucket tappets. Spiral intake ports in the cylinder heads, one of which in each case is optimised for swirl, the other for flow, and which are precisely matched to the symmetrically formed combustion chambers, set the air into fast-swirling motion and so ensure the ideal mixture of fuel and intake air in the partial-load range. An electro-pneumatic intake port cut-out also comes into effect in the partial-load range. By temporarily cutting off one intake port, this increases further the swirl speed of the fuel-air mixture  and thus the cylinder charging rate. The intake system of the new V8 diesel engine also includes an air filter with two hot-film air mass sensors installed in the engine, which give a precise analysis of the air drawn in. These give the microcomputer responsible for the engine management the precise data that enable it, for example, to control the exhaust gas recirculation according to the engine load and speed  all in the interests of lower exhaust emissions. There are two recirculation valves for the exhaust gases  one per cylinder bank. These are controlled electrically by a rotary magnet and regulate the amount of exhaust gas which is recirculated, depending on the load on the engine, in a defined ratio to the intake air. Exhaust gases also flow through a heat exchanger, where they are further cooled. The emissions limits of the new eight-cylinder diesel engine fall well within the EU 3 emissions limits, not only with the help of its efficient exhaust gas recirculation system, which contributes primarily to the reduction of nitrogen oxide emissions, but above all thanks to its sophisticated catalytic converter system. This consists of two exhaust-gas purifiers located near the engine, which begin to act as oxidation catalysts very soon after a cold start and which are responsible for reducing the level of hydrocarbons and carbon monoxide by chemical bonding with oxygen. In order to keep the dimensions as compact as possible, the Mercedes engineers designing the V8 engine decided upon a cylinder angle of 75 degrees, compensating the vibrations typical of this construction concept with a balancing shaft. This is located in the space between the two banks of cylinders and rotates at the same speed but in the opposite direction to the camshaft. At the front end of the balancing shaft is an oil separator, which ventilates the engine by centrifugal force. The solid base of the V8 engine with CDI technology is formed by an aluminium crankcase, manufactured according to a new sand-casting method. The advantage of this is its increased strength, which has given the engineers much more scope in terms of engineering design. For the first time, for example, they have been able to integrate the timing case as well as the oil ducts and returns directly into the crankcase itself. This aluminium construction method not only improves the smoothness of the engine, but also helps reduce its weight: the crankcase of the V8 engine, at 56.2 kilograms, is approximately 17 per cent lighter than the comparable component in the CDI six-cylinder unit of the E 320 CDI. The eight-cylinder engine, with all its ancillary components, weighs a total of 245 kilos and is thus the lightest diesel unit in this displacement category.